The Necronomicon was never meant for the world of the living, but with it Ash unwittingly summoned Kandarian demons in Sam Raimi’s The Evil Dead. Now Fright-Rags resurrects the ancient ‘Book of the Dead’ with The Evil Dead & Necronomicon Collection. 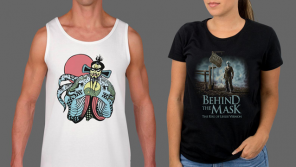 Fright-Rags is releasing even more horror movie tees on February 21, followed by new additions to the Plastic Fang line of non-horror t-shirts on February 23.